Whoo-HOOO!!!! 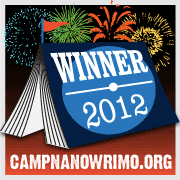 Congratulations, Teresa…AZ :o) Thanks for all the fun you brought to Camp NaNo. You're a great cabinmate…and a real card! Hope you'll sign up for November's NaNo too. Here's to more writing success!